“Durable” and “versatile” are the two words that aptly describe sandstone. Basically a sedimentary rock, sandstone is a prominent construction material that is globally used for landscaping as well as interior and exterior designing and decoration. The versatility of this natural stone can be attributed to its occurrence in a plethora of colors and its innumerable applications in the construction and architectural designing projects. Sandstone is a long lasting and durable stone that can withstand harsh weather conditions. This makes it a perfect choice of outdoor applications. In addition to these, sandstone materials as decorative garden stones have a natural anti-skid surface and become more beautiful with the natural process of aging and weathering; hence can last for decades after installation. Numerous Indian varieties of sandstone are highly popular around the world and a variety of sandstone products are produced and supplied by sandstone manufacturers and exporters from India. A lot of products for both interior and exterior installations are manufactured at state-of-the-art sandstone factories located all across India with most of them being situated near sandstone quarries. In case you want to get decorative garden stones delivered to your offshore location from India, you just need to contact a reputed sandstone exporter from India that can assure you of quality, dedicate customer service, safe packaging and on-time deliveries. For its amazing properties and captivating colors, sandstone is extensively used for decorating outdoors, especially gardens. Within a garden, numerous sandstone products are installed that are not just highly functional, but also add to the beauty of the garden in the most natural way. In addition to paving, sandstone is used to produce articles like statues, fountains and planters that are pretty popular and have been known to be used for garden decoration for ages. 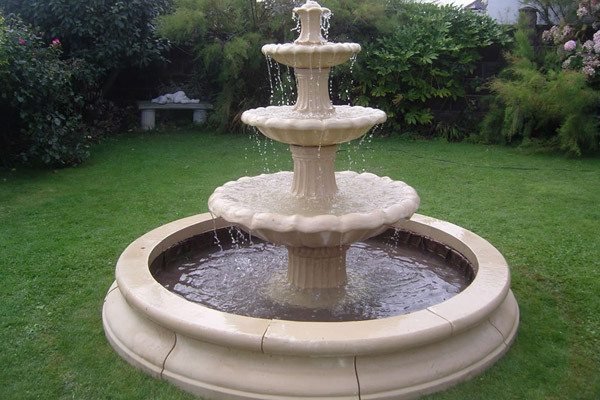 Sandstone fountain is an amazing stuff that graces the garden in numerous designs and styles. Sandstone is easy to cut and carve, thus some unique patterns can be engraved on its exterior surface to add to its beauty. When functional, these fountains make the ambience of the garden lively and happening with numerous jets of water oozing out of the same. Another exclusive decorative garden stones find application in garden is stone lamp. 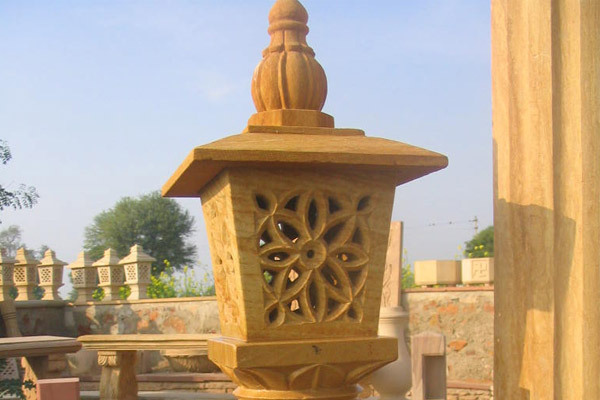 Sandstone lamps are available in an array of designs that are accordingly used to complement a traditional or modern garden setting. These can be placed across the entire garden or in a particular section that need to be lit in dark. Electric bulbs are put inside these lamps that have several holes through which the light beams pass out and strikingly illuminate the space of their installation. Sandstone is a popular material to create garden troughs as troughs made up of sandstone look amazing with weathered texture and alluring shades. Troughs are basically containers that are deep, narrow and long. They are usually kept in gardens to hold a specific variety of decorative or flowering plant or a plant that requires special care and attention. Available in a variety of shapes and designs, stone troughs not just hold plants, but also help in ornamenting the entire garden; when thoughtfully placed in different corners of the garden. Likewise, planters, urns, vases are also created out of sandstone that are used for holding individual plant. In a creative way, they can be placed on block steps and pavements to hold creepers or large plants. In different sizes, shapes and styles, sandstone pedestal is one such article that is fairly decorative as well as functional. Stone pedestals are generally used to hold planters, bird baths and vases in gardens. Nevertheless, with unique styling and engraved patterns, they are frequently found to capture the attention of garden visitors. Furniture is an integral part of almost every garden and sandstone is a widely used material to make the same as this stone offer a permanent seating solution within gardens. These are highly durable and resistant to rough weather conditions. 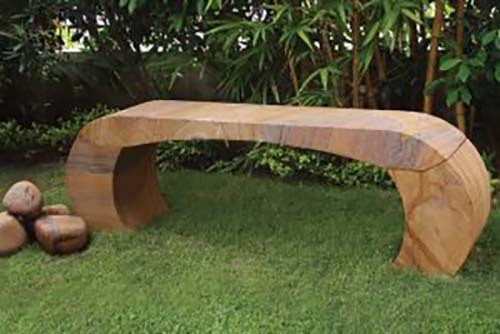 To suit the requirement and choice, sandstone furniture in the forms of chairs, benches and table tops can be installed in different designs, shapes, colors and finishes. Though there are ample of stone stuffs for garden installations, the way a statue embellish a garden is downright incomparable. These highly creative items are meticulously carved out of sandstone blocks by skilled artisans, who with great attention and patience transform a simple block into an amazing piece of art. They can be placed anywhere in the garden to create the desired effect. 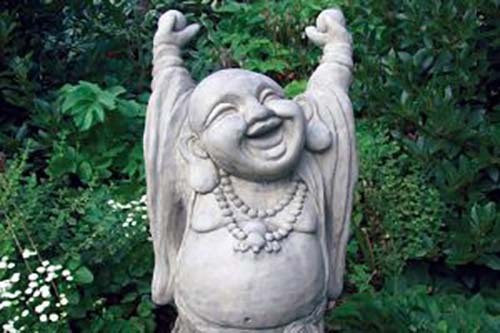 In addition to all these articles, there are a couple of other sandstone products that are used for garden decoration. These include stone balls, millwheels, stone mushrooms, and pillars and columns, among others. Depending on the functionality and aesthetic requirement, individual or a combination of these articles can be tastefully used to breathe a new life into an otherwise dull and soulless garden.